This Pear and Pomegranate Panna Cotta is rich and creamy with a deliciously fruity festive edge. The colours pop on the plate making this make ahead dessert perfect for entertaining. I LOVE the wobble of panna cotta, for me this super soft dessert is all about the wobble. If there is no wobble then the dessert will have the texture of rubber. YUCK. What we are looking for is a panna cotta that if you hit it with your spoon will wobble and jiggle about. That is when you know that it will be soft and light and melt in your mouth. 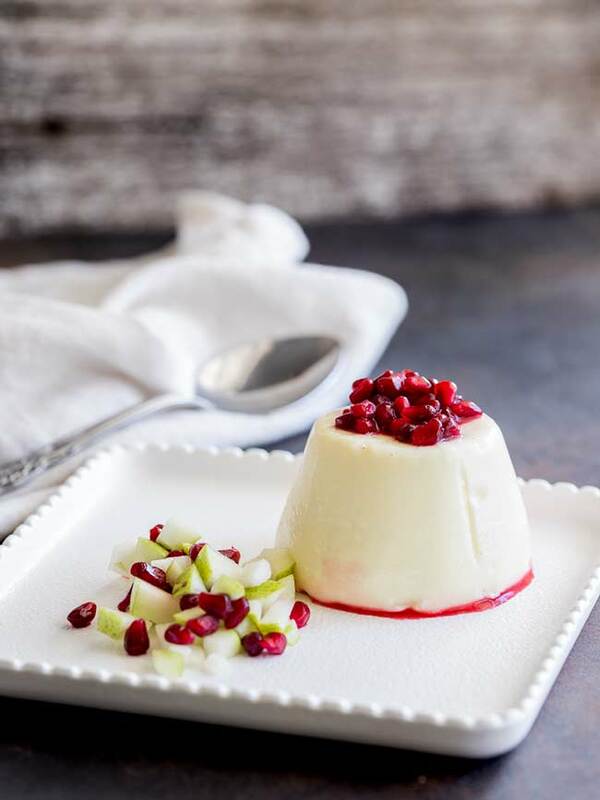 This Pear and Pomegranate Panna Cotta is so perfect for this time of year, as it needs to be made several hours in advance! So you can make it a couple of days before and leave it in the fridge, covered in the moulds until you need it. The night you want to eat it, de-mould, spoon over the fruit topping and dessert is served. Simple, elegant and oh so wobblingly perfect. 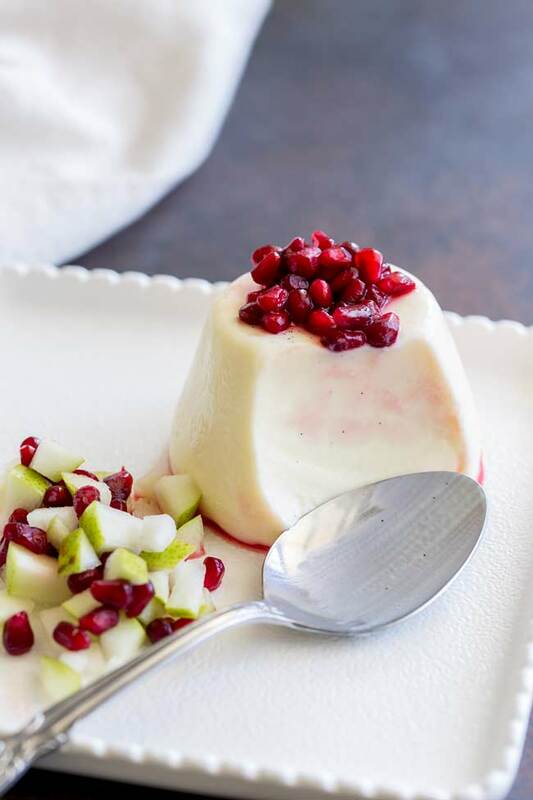 If you love this recipe for Pear and Pomegranate Panna Cotta why not pin it for later. 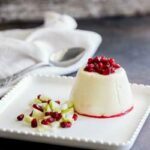 This Pear and Pomegranate Panna Cotta is rich and creamy with a deliciously fruity festive edge. The colours pop on the plate making this make ahead dessert is perfect for entertaining. To make the panna cotta. Pour the cold water into a small bowl and sprinkle the gelatin over it. Let rest for 5 minutes, so the gelatin can dissolve. Mix the milk, vanilla paste and sugar together in a small saucepan and place over a medium low heat. Simmer gently for 5 minutes until the sugar has dissolved. Add the gelatine mixture and whisk together so the gelatine is fully combined. Add in the heavy cream and the pear juice, stir well and then strain through a fine mesh sieve into a jug. Use a pastry brush to oil the inside of your panna cotta moulds (or ramekins). Carefully fill the moulds with your mixture and refrigerate until chilled and set. To make the fruit topping. Chop the pear into small cubes and sprinkle over the lemon juice. Combine the dressed pear with the pomegranate and powdered sugar and stir to combine. Use a knife to ease the panna cotta away from the edge of the mould, upturn a plate onto the mould then tip the plate and mould right side up and gently easy the panna cotta out. 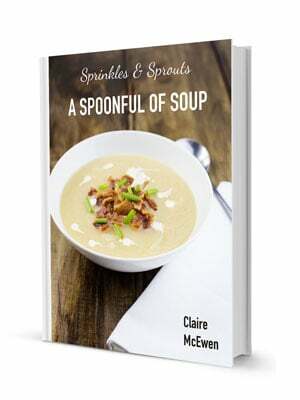 Garnish with a spoon of the fruit topping and serve. 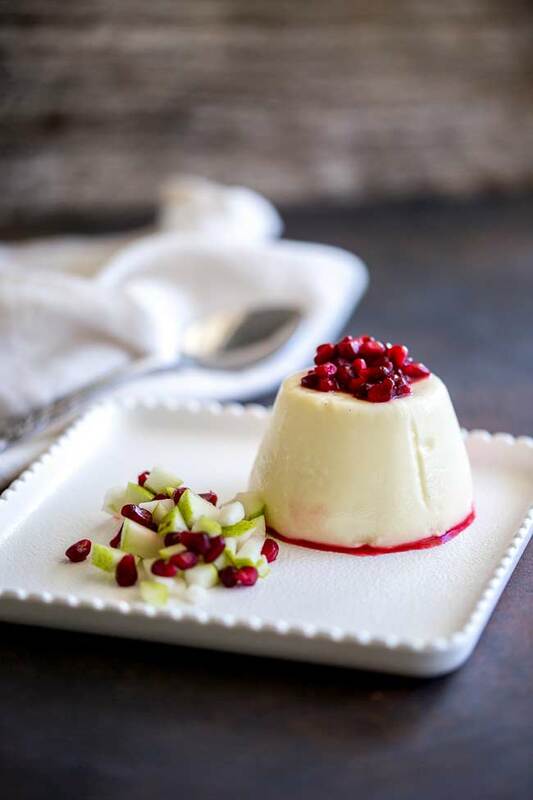 If you love food why not subscribe to my newsletter, I will drop you an email every now and then, just to say hi and send you a couple of recipes think you might love, like this Pear and Pomegranate Panna Cotta. Thanks for sharing this sweet and delicious recipe. It’s looking colourful!! I love the combination; pomegranate increase the attraction of recipe, Thanks for sharing !